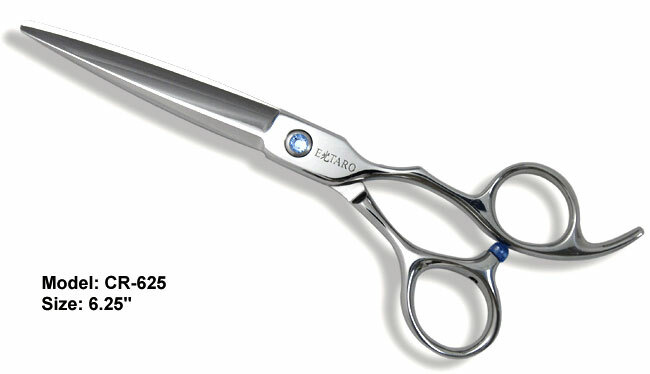 Please Note: All Etaro scissors no longer come with the “blue” stone shown in the picture. Scissors provide freedom without sacrificing support. The CR series is a very comfortable, medium weight scissor with a sculptured permanent finger rest. The ergonomically correct offset handle with cutaway thumb hole provides freedom without sacrificing support. This design allows stylists to effortlessly pivot the scissor to an unlimited number of hand positions and cutting angles with maximum stability. The integrated crane shaped handle enables stylists to keep their elbow in a relaxed, natural position while cutting. The extra wide pivot area ensures smooth cutting action and power. Blade length (tip to pivot) = 2-7/8"
Overall length (tip to end of longest handle) = 6-1/4"